Marshmallows For Breakfast is not the kind of book that I usually pick up. To be honest, I can't actually remember buying this for any better reasons than it was cheap and I liked the title. After Gillespie and I though, I think I needed a simpler read, something that would leave me in a clearer state of mind; a comfort read if you will. In that capacity, Dorothy Koomson has certainly delivered. 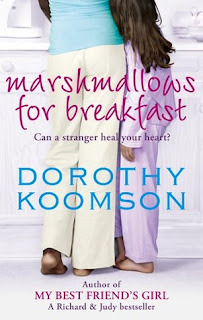 Marshmallows For Breakfast follows Kendra Tamale as she moves to England after living abroad in Australia. Her hopes at finding a simpler life than the one she had in Australia are quickly dashed when she finds herself helping her landlord's two young children, Summer and Jaxon, as they struggle to deal with their parents' inevitable separation. While the children and their father manage to worm their way into her affections, Kendra is keeping a huge, incredibly painful secret from them. In regards to the plot, I liked it, but I couldn't help but feel that it was kind of, well, amateurish. The main thing that I can think of is that it feels like the novel tried to tackle too many "big" issues; quite frankly, I think that the pressures of looking after someone else's children and the fallout that comes from divorce are subjects that can easily take up a whole novel by itself. The fact that there are at least three other big issues that get discussed as part of the narrative makes it feel a bit like Dorothy Koomson wrote this more as a way to get her views out to the public. While she does manage to mostly make the inclusion of these issues fit, it does feel a little preachy; the closest character that you could consider a villain is undoubtedly evil and completely unrepentant for what he has done, which just feels weird considering the comparatively balanced and sympathetic way that almost every other character is portrayed in, despite their failings and issues. One thing that I will give Dorothy Koomson credit for is that she doesn't feel the need to force a romance into the already full narrative. The characters are well-written and sympathetic, especially Summer and Jaxon; I was actually rather surprised to find myself liking the two kids, despite the frequent moments in which they act up like every small child you are ever likely to meet. Apart from the children though, there weren't really any characters that really stood out as such. Well written, but not great.